Although probably better known for its traditional culture and technologically advanced cities, Japan is also a country of mountains. More than seventy percent of the volcanic archipelago is covered by towering volcanic peaks and snow capped summits; and these mountains, which have traditionally held important religious and cultural significance, provide nothing short of a haven for outdoor sports enthusiasts. Naturally the country has developed a vibrant hiking culture to go along with its geography. Whether you are seeking long, multi-day treks through the national parks or easy daytrips from the city, Japan offers abundant hiking opportunities through a diverse set of climates and difficulty levels. Easy Casual day hikes that are well traveled and well marked. They are are often easily accessible by public transportation or are at least located close to local accommodation. No special equipment is necessary. May also be appropriate for hiking with younger children. Medium May include sections that are steep, long or both. With ample time, they should be doable by a person of average athletic ability. Hiking boots are recommended but not necessary. These hikes may not be suitable for younger children. Difficult Long and strenuous trails that may require maps and navigational skills to complete. Difficult trails should not be undertaken without proper preparation and equipment, and hiking boots are highly recommended. Less than an hour from central Tokyo, Mount Takao is one of the closest nature spots to the city. 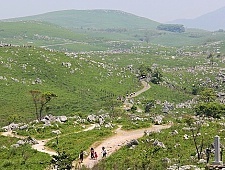 Various trails lead up the mountain and beyond. The main trail is paved and passes through the Yakuoin temple grounds before reaching the summit which offers views of Mount Fuji on clear days. 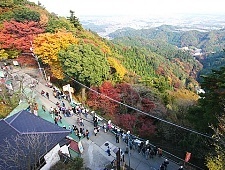 Mount Takao can be crowded, especially on weekends. Mount Mitake is another popular hiking destination close by Tokyo. 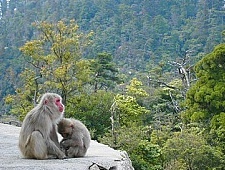 Located in the mountains of Chichibu-Tama-Kai National Park, it takes just two hours to reach from the city. Visitors can hike the trails through virtually unspoiled nature, stopping at a variety of waterfalls, small shrines, and peaks along the way. 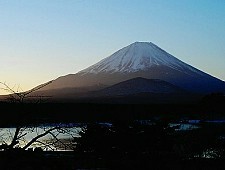 Mount Fuji, Japan’s tallest and most famous mountain, is climbed by several hundred thousand people each year. Most visit during the main hiking season in July and August, although some of the hiking facilities are also available during September. Outside of that time, it is dangerous to ascend the mountain. A few shorter, casual hikes are also available, such as the walks to Kofuji and Hoeizan. In addition to being a UNESCO World Heritage Site, much of Nikko is also a national park that offers visitors a large variety of outdoor attractions to see in the lakes, mountains and waterfalls of Okunikko. 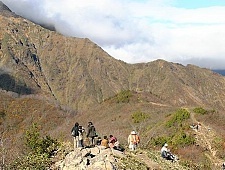 Hiking trails connect many of the attractions such as the attractive walk from Ryuzu Waterfall to Yumoto Onsen via theSenjogahara Marsh. 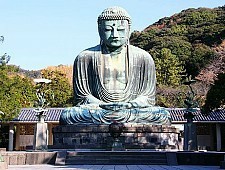 Kamakura is another popular destination near Tokyo for people seeking culture. A network of hiking trails is hidden in the forested hills above the city’s famous temples and shrines, and can be used as an attractive, alternative way to walk between some of the city’s sights. The trails can be slippery after rainfall. About 100 kilometers from Tokyo, Hakone is a popular hot spring resort in the mountains of the Fuji-Hakone-Izu National Park. There is a variety of hiking trails around Hakone, most of which lead through the forest with limited views over the surrounding scenery. 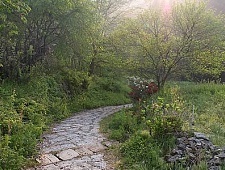 Among the trails are sections of the Old Tokaido. 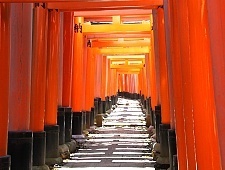 Fushimi Inari Shrine is an important Shinto shrine in the south of Kyoto City. The shrine features thousands of vermillion torii gates that form tunnels along the network of trails leading from the shrine’s main buildings to the top of the sacred mountain behind. Daigoji is an important temple in southeastern Kyoto. The main temple complex lies at the base of a mountain, while the original temple grounds can be found near the summit and are reachable by a steep mountain trail through the forest. Those who separate themselves from the crowds and make the climb are rewarded by wooden halls set along the quiet, forested mountainside and panoramic views. Kurama is a rural town in the mountains of northern Kyoto, less than one hour from the city center. 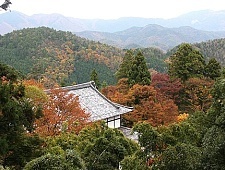 Kurama is best known for Kurama-dera Temple, which stands at the top of a steep, wooded mountainside. 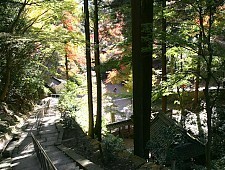 After making the 30-45 minute walk to the temple, visitors can continue on a hiking trail that leads up and over the mountain to Kibune in the neighboring valley. 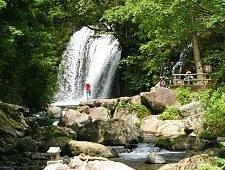 Minoo Park is a forested valley on the outskirts of Osaka, just north of the urban sprawl. Located just 30 minutes from the city center, the park is the closest spot to the city to see nature. During autumn it is one of the best places in the Kansai Region to see autumn colors in a natural setting, as opposed to fall foliage found at temples and gardens. Mount Koya has long been a popular pilgrimage site, and a network of pilgrimage trails connect the secluded mountain temple community to the outside world. The main Koyasan Choishi Michi trail is a 23.5 kilometer, 7 hour hike, but visitors can shorten the trek by accessing the trail from different points along the Nankai Koya Line. 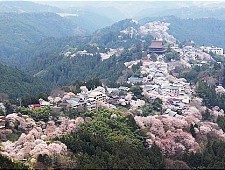 Mount Yoshino is a wooded temple town on the mountain slopes of Nara Prefecture. The country’s most famous cherry blossom spot, Yoshino’s mountain side is covered by over 30,000 cherry trees that usually bloom from early to mid April. Visitors can enjoy the trees along a small network of hiking trails that lead around the mountain. A more difficult pilgrimage trail to Mount Omine begins at Kinpusenji Temple. Part of Japan’s northernmost national park, Rishiri and Rebun are two beautiful islands that lie just off the coast of northern Hokkaido.Rebun is most famous for its rich flora and views of nearby Rishiri, which can be enjoyed from a variety of hiking trails that lead around the island. 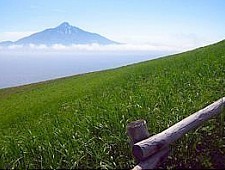 Experienced hikers may wish to visit Rishiri instead to climb the dormant volcano at the center of the island. Shiretoko in eastern Hokkaido is one of Japan’s most beautiful and unspoiled national parks. The furthest reaches of the remote peninsula can only be viewed from sightseeing boats or reached on multi-day trekking tours. 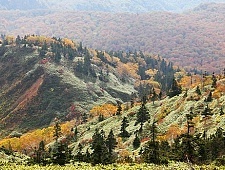 Shiretoko is famous for its dense brown bear population. There are several other easier hikes around as well such as the trails around the park’s beautiful Five Lakes or to Furepe Waterfall. 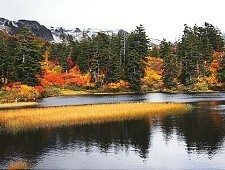 Akan is a popular national park in eastern Hokkaido with three scenic lakes. It is known for its natural scenery, such as Lake Mashu, which is often considered Japan’s most beautiful lake. The more difficult hikes in the area include the ascents up Mount Oakan and Mount Meakan around Lake Akan. A trail also leads around part of Lake Mashu. Daisetsuzan, Hokkaido’s largest national park, is a mountain paradise of unspoiled wilderness and the first place in Japan to see autumn colors and snow each year. The park is one of the few places where you can do week-long treks completely surrounded by nature, although there are lots of shorter dayhikes to explore, as well. 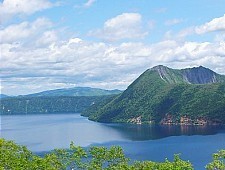 Lake Shikotsuko is a sparsely developed crater lake in eastern Hokkaido. 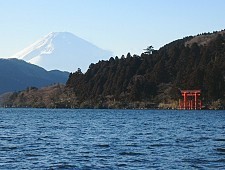 The lake is encircled by mountains, including Mount Tarumae, one of Japan’s most active volcanoes. Visitors can climb up the barren, smoking mountain to the rim of the crater and enjoy views out over the volcanic landscape. It is also possible to circle the crater. 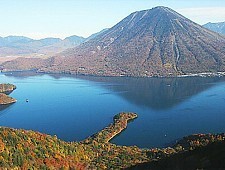 Part of the Shikotsu Toya National Park, Lake Toya offers a variety of outdoor activities such as hiking and hot springs within easy reach of Sapporo. 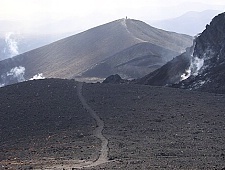 Along the Nishiyama Crater Trail, hikers can witness the landscape of abandoned buildings and smoking craters that resulted from Mount Usu‘s most recent eruption in 2000. Noboribetsu is Hokkaido’s most famous hot spring resort. A network of hiking trails leads around the hills that surround the local Hell Valley above the resort town to sulfurous mud ponds and a river where you can dip you feet into the naturally hot water. Afterwards, head down to the hot springs for a well deserved bath. 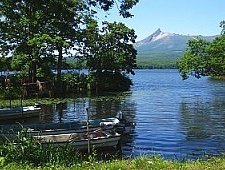 Located just north of Hakodate, Onuma Park is a “quasi national park” known for its picturesque, island dotted lakes and majestic volcano, Mount Komagatake. Attractive walking courses, connected by small bridges and walkways, lead around the lakes and islands and can be enjoyed in easy 15-60 minute walks. The picturesque Oirase Stream, which drains Lake Towada in Aomori Prefecture, runs along a deep gorge covered in lush green vegetation. 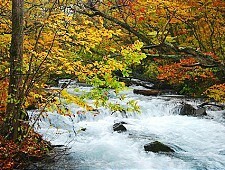 In autumn the stream transforms a popular fall color spots. An easy to walk nature trail follows the stream for over ten kilometers. 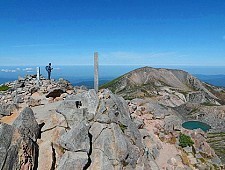 Mount Hakkoda is a beautiful mountain that lies between Lake Towada and Aomori City. A ropeway leads all the way to one of its summits, from where hiking trails branch out to other peaks and down to the base of the mountain. 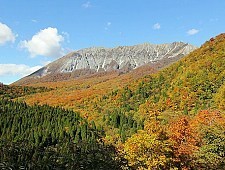 In fall, Mount Hakkoda’s slopes are one of the first spots in Tohoku to be covered with autumn colors. 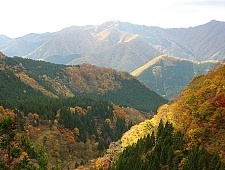 Shirakami Sanchi is an extensive mountain range straddling the border between Aomori and Akita prefectures. One of Japan’s first UNESCO World Heritage Sites, Shirakami Sanchi boasts several hiking trails that lead to waterfalls, mountain peaks and lakes around the region’s beech forests. One of the most popular hikes leads to the Anmon Falls, a beautiful set of three waterfalls that are about a 90 hike into a valley. Hit badly by the 2011 tsunami, the Sanriku Coast stretches along the Pacific Ocean across Aomori, Iwate and Miyagi Prefectures. Hiking trails can be found along many sections of the coast, and work to combine the segmented hikes into one continuous coastal trail, the Michinoku Shiokaze Trail, is currently underway. Located along the volcanic interior mountains of the northernTohoku Region, Hachimantai offers visitors some of Japan’s best rustic hot springs and is also famous for its autumn colors. 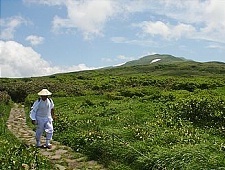 Hiking opportunities include trails to Mount Akita-Komagatake and Mount Hachimantai. Mount Zao is a volcanic mountain range on the prefectural border between Yamagata and Miyagi Prefectures. 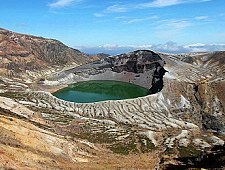 While most famous for its snow monsters in winter, the area also offers hiking opportunities with spectacular views of the Okama Crater in summer and autumn. Dewa Sanzan are three sacred mountains in remote Yamagata Prefecture, each with a shrine at or near its peak. It is an important center of Shugendo mountain worship, where visitors can join pilgrims dressed from head to toe in white robes as they climb the steep, traditional trails to the shrines. Mount Bandai is a beautiful part of western Fukushima Prefecture that offers visitors lots of outdoor activities such as hiking and boating. Some of the most popular hikes include the leisurely trails around Urabandai, the climb to the summit of Mount Bandai and the majestic crater and marshlands around nearby Mount Azuma. Oze National Park centers around a large marshland at an altitude of 1400 meters in the border area between four different prefectures. 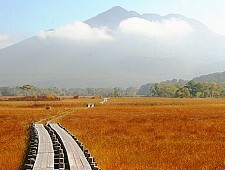 Reachable by hiking trails that descend down from the surrounding mountains, visitors can explore the highland marsh via a network of elevated boardwalks. 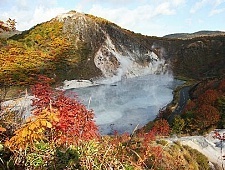 The volcanic Mount Shirane is a popular outdoor recreation area that towers above Kusatsu Onsen in northwestern Gunma Prefecture. A network of hiking trails lead from the top of the mountain down to the town below, stopping by various peaks, craters, lakes and a waterfall in the area. A ropeway can be used to bypass some of the trails. 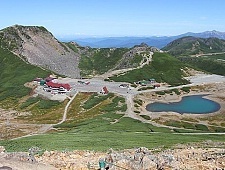 The majestic Mount Tanigawa is a popular hiking destinations with a challenging ridge trail that straddles the border between Gunma and Niigata Prefectures. Just to the south is Minakami, a popular hot spring and outdoor sports area, that offers a variety of outdoor activities such as whitewater rafting, canyoning, mountain biking and bungee jumping. 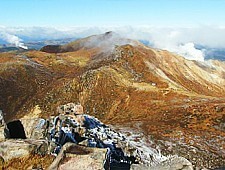 Mount Nasudake is an active volcano in northern Tochigi Prefecture. The mountain is a popular hiking destination, with a ropeway and trail to the summit, and a variety of other trails and pedestrian suspension bridges further down the mountain. Casual hikers may want to check out Heisei no Mori, a forested park that used to be an Imperial Villa and summer retreat of the imperial family. At the heart of Izu Oshima, the largest of the Izu Islands, is the 758 meter tall Mount Mihara. Various hiking trails lead up to the crater of the active volcano, which last saw a major eruption in 1986. 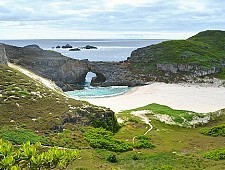 The Ogasawara Islands are a remote island chain 1000 kilometers south of Tokyo. Designated a World Heritage Site, the subtropical islands offer several different outdoor activities such as whale and dolphin watching, sea kayaking, snorkeling and diving. There is also a variety of hiking trails that lead through the islands’ jungles tobeaches, cliffs, and viewpoints around the islands. 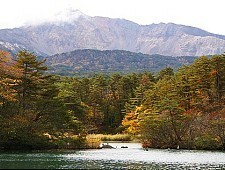 Kamikochi is a popular outdoor resort in the Northern Japan Alps. The beautiful, flat valley is surrounded by tall mountains and features some of Japan’s most spectacular mountain scenery. A variety of hiking trails, ranging from casual strolls to extensive multi-day traverses, lead around the area as well as over the mountains to other parts of the region. The southernmost peak of the Northern Japan Alps, Mount Norikura is a magnificent 3026 meter high mountain. It is one of the easiest of the really tall mountains to climb thanks to buses that go nearly all the way to the summit. Purists, however, can stick to the trails lead all the way down to the base of the mountain. Several other hiking trails can be found around Norikura Kogen further down the mountain. 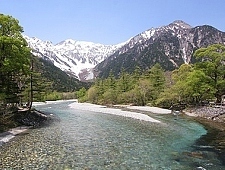 The Kiso Valley runs along the mountains of the Central Japan Alps in Nagano Prefecture. The Nakasendo, one of the most important road connections between Edo and Kyoto during the Edo Period, ran along the valley. Today, visitors can hike along sections of the former Nakasendo, stopping at nicely preserved post towns along the way. 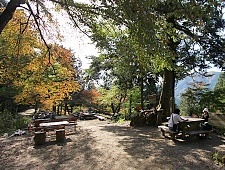 The most popular section connects Magome with Tsumago. 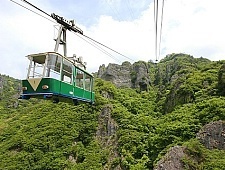 The Tateyama Kurobe Alpine Route connects Toyama and Nagano Prefectures through the magnificent scenery of the Northern Japan Alps via a combination of cablecars, buses and a ropeway. In summer and fall, a wide variety of hiking opportunities are available from trailheads along the Alpine Route, especially around its highest point, Murodo. 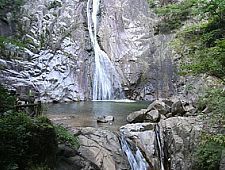 The Shosenkyo Gorge is a popular gorge in Chichibu Tama Kai National Park. A trail follow the Arakawa River through the gorge to the beautiful Sengataki Waterfalls and a ropeway that offers visitors magnificent vistas out over the forested mountains. The gorge is especially popular during the autumn color season. 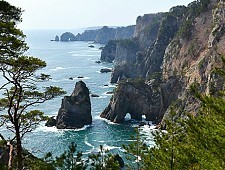 The Izu Peninsula is a popular hot spring resort area about 100 km southwest of Tokyo. Featuring beautiful coastlines, beaches and a scenic mountainous interior, the peninsula also offers hikers some attractive hiking opportunities, including trails along the Jogasaki Coast and to the Kawazu Nanadaru Waterfalls. 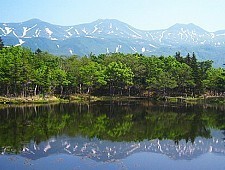 The centerpiece of Hakusan National Park, Mount Hakusan is the tallest mountain in western Japan and an important spiritual symbol. 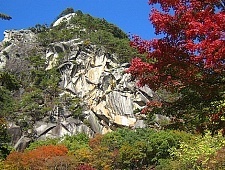 Although covered in snow for much of the year, the mountain becomes a popular hiking destination from June to October. 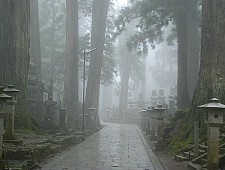 Located at the southern tip of the Kii Peninsula, Kumano is an important region infused with religious value. 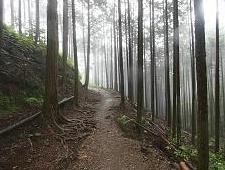 For over 1000 year pilgrims have traveled the Kumano Kodo, a network of pilgrimage trails that connect the Kumano Shrines to each other and to other significant religious sites in the region. Many of these trails are still in use today. 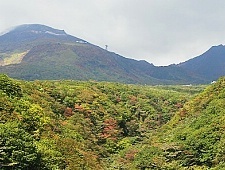 A hiking trail just north of the Shin-Kobe shinkansen station leads into the southern slopes of the Rokko mountain chain to the Nunobiki Waterfall. Further up the mountain is a herb garden and an observation deck that offers spectacular views of Kobe, especially after dark. 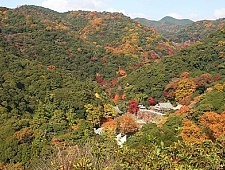 Mount Shosha, at the edge of Himeji City, is home to Engyoji, an atmospheric temple complex spread out over the densely forested mountain top. 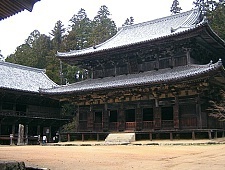 Visitors can explore the temple’s three massive wooden halls, which are connected to each other by a network of forested trails. Mount Daisen is a large volcano that dominates the landscape of western Tottori Prefecture. The mountain is ranked among Japan’s top 100 mountains and is a popular hiking destination with several strenuous routes leading up to some of the its highest peaks. Miyajima, in addition to being an immensely popular tourist destination, is also a nice hiking destination with several hiking trails leading up to the summit of Mount Misen at the center of the island. The trails offer nice views out over the Seto Inland Sea, and the occasional glimpse of wild monkeys and deer along the paths. One of the most unique landscapes of Japan, Akiyoshidai is a vast plateau dotted with thousands of limestone pinnacles formed from the coral reefs that used to cover the plain 300 million years ago. A hike is best combined with a visit to Akiyoshido, Japan’s largest cave. The Iya Valley is a remote, mountainous valley in westernTokushima, located deep in the heart of Shikoku Island. 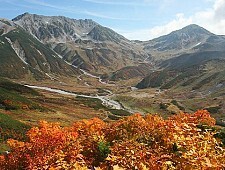 The region is home to Mount Tsurugi, the second tallest peak on Shikoku and one of Japan’s top 100 mountains. A relaxing chairlift takes casual hikers nearly to the top of the 1955 meter high peak, while more dedicated hikers can stick to the hiking trails that start at the mountain’s base. Shodoshima, renowned for olive groves and Mediterranean like atmosphere, is the second largest island in the Seto Inland Sea. The mountainous interior is home to the Kankakei Gorge, a breathtaking ravine that is considered one of Japan’s three most beautiful gorges. In addition to a ropeway, two hiking trails run the length of the gorge, ascending the beautiful ravine. Famous for autumn colors. Awashima is a star shaped island just off the coast of western Kagawa Prefecture. 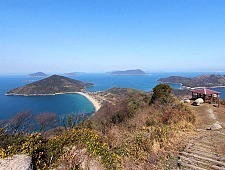 There is a nice climb up to the Jonoyama Viewpoint from where you can look out over the island’s small, nostalgic port town and take in beautiful panoramas of the Seto Inland Sea. 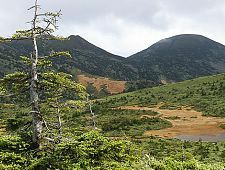 Part of the Aso-Kuju National Park, the Kuju Mountains comprise a dramatic, volcanic landscape that includes the highest peaks on the island of Kyushu. While the trails to Kuju’s peaks are somewhat challenging, a network of boardwalk trails near the Chojabaru Visitor Center at the base of the mountain offers easier walking opportunities. 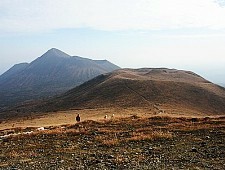 Mount Aso is a large, active volcano in the center of Kyushu. The mountain’s caldera, created by gigantic eruptions in the distant past, is one of the largest in the world. 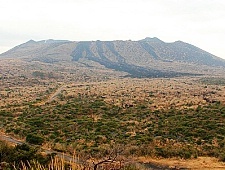 A variety of hiking trails lead around the craters and peaks of the area. 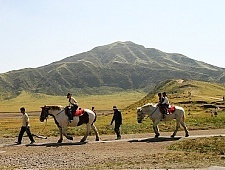 In addition, visitors can try outdoor activities, such as horseback riding at the Kusasenri-ga-hama Plain. Mount Unzen is a one of Japan’s deadliest volcanoes. It most recently erupted in the early 1990s with devastating effects as the superheated volcanic gases and mudslides killed several people and destroyed homes along the way. 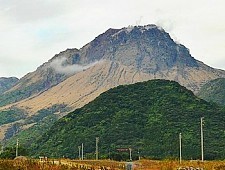 The mountain is also recognized for its natural beauty. 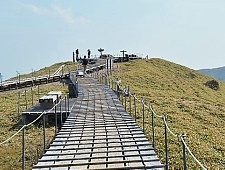 Visitors can take a ropeway part way up the slope, from where a network of hiking trails leads to the summit. Kirishima is an active volcanic mountain range that straddles the border between Kagoshima and Miyazaki Prefectures. 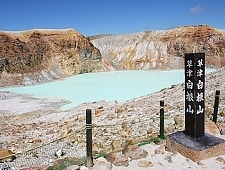 It offers some of Japan’s most spectacular scenery with multiple pretty volcanic cones and craters. It is also an excellent hot springs destination. 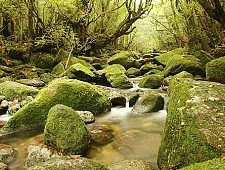 Yakushima is a heavily forested, subtropical island just south of Kyushu. The island is covered by old growth cedar forests, where several thousand year old cedar trees can still be seen. The island offers many hiking opportunities, including the long journey to the 7000 year old Jomonsugi near the center of the island and easier trails around the Shiratani Unsuikyo and Yakusugi Land. Although Okinawa is better known for it beaches and aquarium, this sub-tropical island offers a few hiking opportunities, especially around the less populated northern end of the island. One of the most attractive hikes leads to Hiji Waterfall, which is about a 40 minute hike from the trailhead along a forested trail. 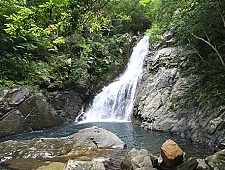 Part of the sub-tropical Yaeyama Islands, Iriomote offers visitors the unique experience of hiking through jungles. 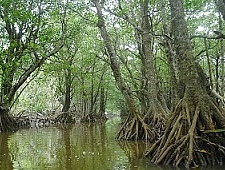 Many visitors do a little hiking as part of the Urauchi River Cruises, while it is also possible to combine some hiking with a kayak or canoe tour through the mangrove lined rivers. A much more difficult and dangerous trans-island crossing is also possible via a trail through the island’s interior.